John Burroughs should be as well known as Henry David Thoreau. He was one of the preeminent naturalists of the late nineteenth and early twentieth centuries, a contemporary and friend of Walt Whitman, a companion of President Theodore Roosevelt, and a distinguished writer and conservationist. His nature essays are a joy to read, especially for those who, like me, grew up in the Catskill Mountains of upstate New York which John Burroughs called home. This post, however, is about his poetry, or, rather, one of his poems, “The Bluebird,” which was first published in Harper’s Magazine in June of 1903. Before I go any further let me simply share his poem with you. There are no deep meanings in this poem. Burroughs says what he means and you can tell that he really means it. He is happy the bluebird has returned and he hopes that it will nest by his house in “Downy’s cell,” that is, the abandoned hole of a Downy Woodpecker. Considering how many people now build or buy nestboxes in the hope that bluebirds will take up residence it is clear that Burroughs is not alone in this sentiment, though in the early 1900s it seems likely that there were less people specifically beseeching bluebirds to nest by their homes. The simple language, with no words over three syllables, combined with the straightforwardness of the text makes the poem accessible, much like Burroughs tried to make the meanings of the natural world accessible to his readers. Even the mild anthropomorphizing in the poem seems meant to help the masses connect to the bird. What “bride” wouldn’t be homesick after a winter away? What I like most about “The Bluebird” by John Burroughs is that it shows how simple language and text meant to be taken literally can combine to create a poem worth remembering. *From his essay, also called “The Bluebird” that appeared in his famous collection of nature essays, Wake-Robin. I love this. The mental pictures it makes are better than any movie. 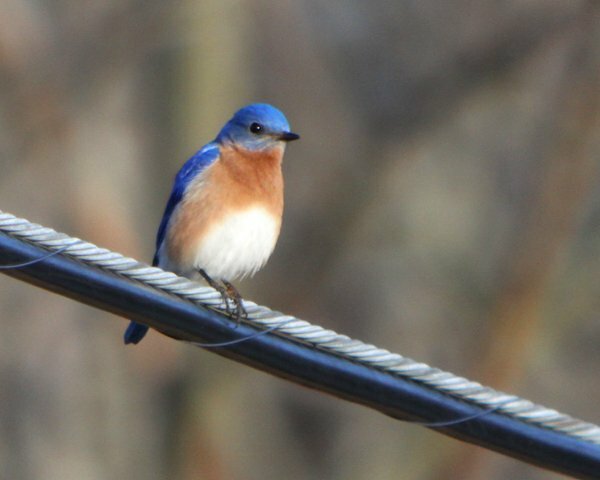 Bluebirds have been on my mind lately. This poem captures the wistful reasons why. Thanks, Corey! Lovely poem and lovely analysis, Corey. Were you a lit major? @Mom: I know what I am getting you for your birthday this year then. @Meredith: I graduated from SUNY-Binghamton with a BA in Literature.